So…when was it? A powerful belly laugh shifts your vibration in an instant, changes your mood, it even changes your body chemistry. While we don’t really know the reason laughter began on as an evolutionary characteristic, scientists think it could be to help bring people together in a bond of good feeling, according to an article in Psychology Today. The other night, my family and I had a riotous night. We laughed so hard, we couldn’t breathe and felt sore stomach muscles the next day. It felt AWESOME and the happy feel we created together continues today, a couple of days later. Need to change you energy? Need to up your Feel Good? You need to laugh. Really, laugh. 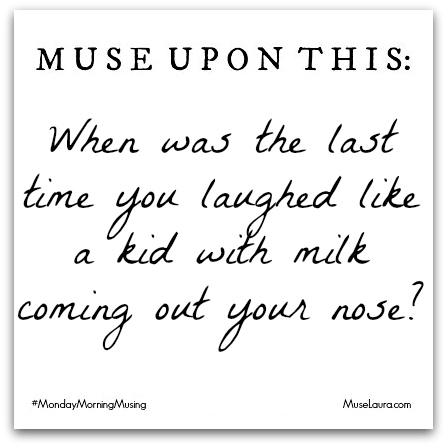 Laugh like a kid with milk coming out your nose. Let these videos help get you started. They are what got us started! Enjoy!